With this new mapping of royal jelly proteins, future studies will examine not only the antimicrobial aspects of this magnificent product produced for the queen, but numerous other beneficial effects already documented. 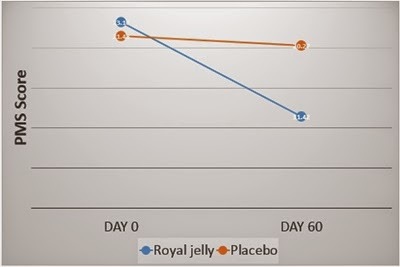 The proteins in royal jelly (RJ) play a pivotal role in the nutrition, immune defense, and cast determination of honeybee larvae and have a wide range of pharmacological and health-promoting functions for humans as well. 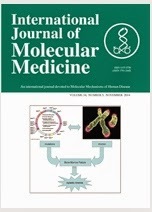 Although the importance of post-translational modifications (PTMs) in protein function is known, investigation of protein phosphorylation of RJ proteins is still very limited. 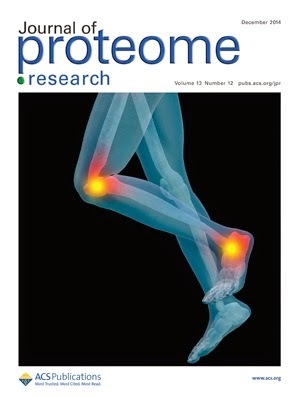 To this end, two complementary phosphopeptide enrichment materials (Ti4+-IMAC and TiO2) and high-sensitivity mass spectrometry were applied to establish a detailed phosphoproteome map and to qualitatively and quantitatively compare the phosphoproteomes of RJ produced by Apis mellifera ligustica (Aml) and Apis cerana cerana (Acc). 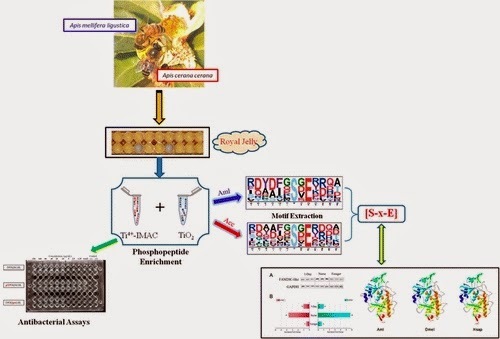 In total, 16 phosphoproteins carrying 67 phosphorylation sites were identified in RJ derived from western bees, and nine proteins phosphorylated on 71 sites were found in RJ produced by eastern honeybees. Of which, eight phosphorylated proteins were common to both RJ samples, and the same motif ([S-x-E]) was extracted, suggesting that the function of major RJ proteins as nutrients and immune agents is evolutionary preserved in both of these honeybee species. 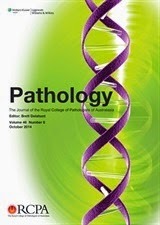 All eight overlapping phosphoproteins showed significantly higher abundance in Acc-RJ than in Aml-RJ, and the phosphorylation of Jelleine-II (an antimicrobial peptide, TPFKLSLHL) at S6 in Acc-RJ had stronger antimicrobial properties than that at T1 in Aml-RJ even though the overall antimicrobial activity of Jelleine-II was found to decrease after phosphorylation. The differences in phosphosites, peptide abundance, and antimicrobial activity of the phosphorylated RJ proteins indicate that the two major honeybee species employ distinct phosphorylation strategies that align with their different biological characteristics shaped by evolution. 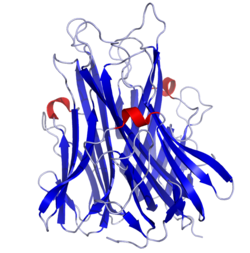 The phosphorylation of RJ proteins are potentially driven by the activity of extracellular serine/threonine protein kinase FAM20C-like protein (FAM20C-like) through the [S-x-E] motif, which is supported by evidence that mRNA and protein expression of FAM20C-like protein kinase are both found in the highest level in the hypopharyngeal gland of nurse bees. Our data represent the first comprehensive RJ phosphorylation atlas, recording patterns of phosphorylated RJ protein abundance and antibacterial activity of some RJ proteins in two major managed honeybee species. These data constitute a firm basis for future research to better understand the biological roles of each RJ protein for honeybee biology and human health care. Propolis is a natural honeybee hive product with the potential for use in the treatment of dermatological conditions, such as cutaneous abrasions, burns, and acne. 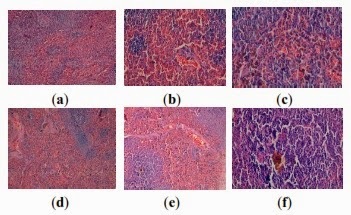 In this study, we investigated whether propolis stimulates hair growth in mice. 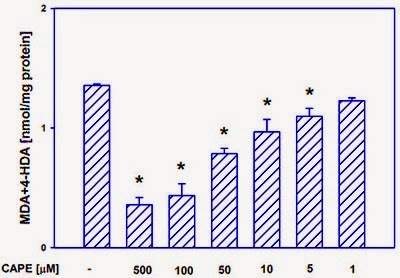 Ethanol-extracted propolis, which contains various physiologically active substances such as caffeic acid and kaempferol, stimulated anagen induction in shaved back skin. Anagen induction occurred without any detectable abnormalities in the shape of the hair follicles (HFs), hair stem cells in the bulge, proliferating hair matrix keratinocytes in the hair bulb, or localization of versican in the dermal papilla. 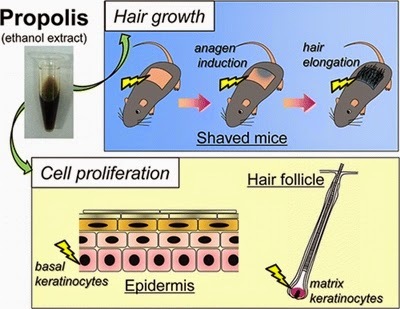 Propolis treatment also stimulated migration of hair matrix keratinocytes into the hair shaft in HFs during late anagen in the depilated back skin. Organotypic culture of skin containing anagen stage HFs revealed significant stimulation of hair matrix keratinocyte proliferation by propolis. Furthermore, propolis facilitated the proliferation of epidermal keratinocytes. These results indicate that propolis stimulates hair growth by inducing hair keratinocyte proliferation. Recognized for many years as a nutritional supplement for athletes, this new study reveals that fresh bee pollen improved metabolism and muscle mass in aged rats. An important revelation for an aging population where malnutrition often surfaces. Although the management of malnutrition is a priority in older people, this population shows a resistance to refeeding. 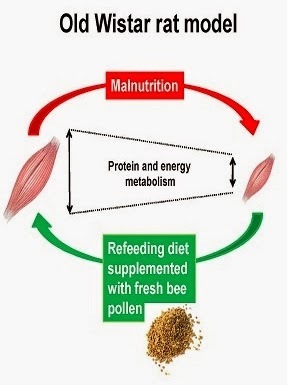 Fresh bee pollen contains nutritional substances of interest for malnourished people. 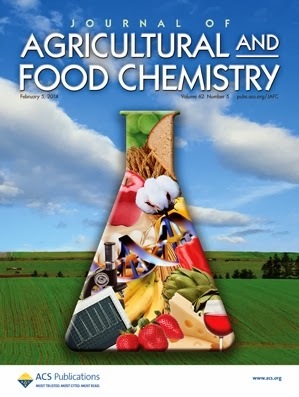 The aim was to evaluate the effect of fresh bee pollen supplementation on refeeding efficiency in old malnourished rats. Male 22-month-old Wistar rats were undernourished by reducing food intake for 12 weeks. The animals were then renourished for three weeks with the same diet supplemented with 0%, 5% or 10% of fresh monofloral bee pollen. Due to changes in both lean mass and fat mass, body weight decreased during malnutrition and increased after refeeding with no between-group differences (p < 0.0001). Rats refed with the fresh bee pollen-enriched diets showed a significant increase in muscle mass compared to restricted rats (p < 0.05). 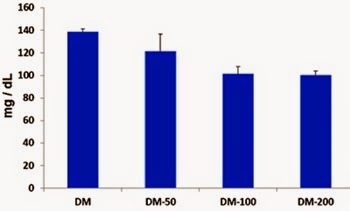 The malnutrition period reduced the muscle protein synthesis rate and mTOR/p70S6kinase/4eBP1 activation, and only the 10%-pollen diet was able to restore these parameters. Mitochondrial activity was depressed with food restriction and was only improved by refeeding with the fresh bee pollen-containing diets. In conclusion, refeeding diets that contain fresh monofloral bee pollen improve muscle mass and metabolism in old, undernourished rats. Apitherapy is the use of one or more products from honey bees to heal or prevent diseases. This abstract doesn't specify which bee products were used, but individual studies concerning the dermatological therapeutic effects of propolis, honey, royal jelly and bee venom are numerous. In general, studies in Apitherapy show a 'synergistic effect' when multiple bee products are combined, providing a more potent solution. J Dermatolog Treat. 2014 Nov 26:1-19. 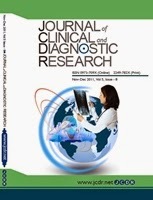 No universal consensus about optimal modality for treating the recalcitrant localized plaque psoriasis (RLPP). To evaluate the immunological and clinical therapeutic effect of using Apitherapy in the treatment of RLPP. Randomized fifty patients with RLPP received Apitherapy (n = 25) and placebo (n = 25) every week. Both treatments were injected into lesions at weekly intervals for a maximum of 12 treatments. Following up was 6 months later. 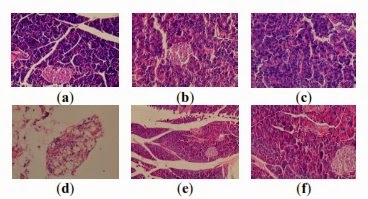 Tumor necrosis factor-alpha (TNF-α) level was measured at pre-study and at 12th week. 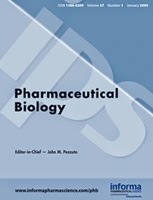 A significant difference was found between the therapeutic responses of RLPP to Apitherapy and placebo group (P < 0.001). In the Apitherapy group, complete response was achieved in 92 % of patients. There was statistically significant decrease in TNF-α in Apitherapy group versus placebo group. No recurrence was observed in Apitherapy group. Apitherapy is effective and safe treatment for recalcitrant localized plaque psoriasis, when other topical or physical therapies have failed.